Samuel Chang, owner of Blue Shades at 256 Park Ave., attended South High after coming to the city in 1981. Worcester’s food scene continues to evolve. From eclectic restaurants like deadhorse hill to ramen noodle bars in the Canal District and downtown, Worcester’s growth as a food hub clearly isn’t finished yet. Only a few years ago, Worcester was barely recognized for its culinary scene – apart from the lengthy list of restaurants owned by Niche Hospitality Group – and now, it is known as a destination for adventurous eaters, food enthusiasts and restaurant influencers. Even so, it could be argued that Worcester lacked one main foodie attraction: an Instagram-worthy restaurant with a cult-like following specializing in a single, signature dish. On Park Avenue – which features a formidable “restaurant row” in its own right – sits a newly opened restaurant that should interest local food lovers, coffee aficionados and Instagram-crazed bloggers seeking a unique experience: Blue Shades. 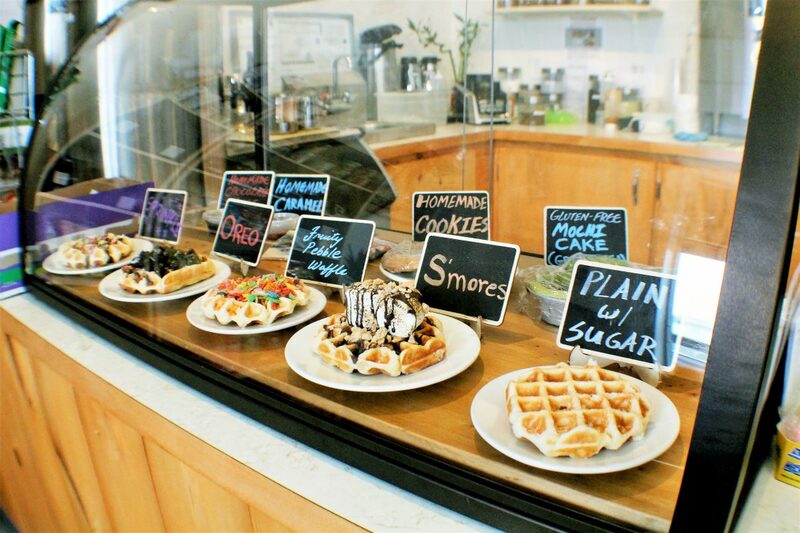 A selection of signature Liege waffles on display. If you couldn’t tell by the massive inflatable often swinging from the awning, Blue Shades, which opened in mid-November, is Worcester’s first Liège waffle shop. It’s quickly become the slice of foodie heaven Worcesterites didn’t know they needed. 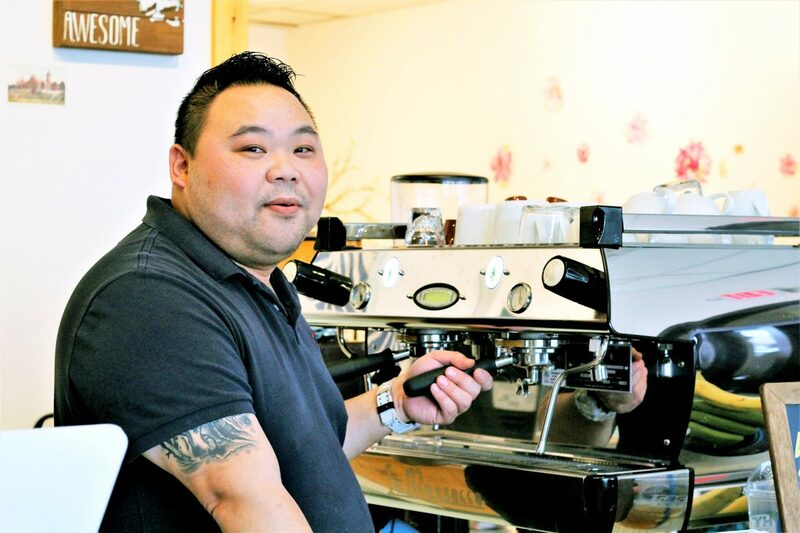 And while waffle shops and coffee houses may be part of an oversaturated market in many major cities, Blue Shades owner and operator Samuel Chang — with a little help from his sister Tiffany — believes he’s found a recipe to keep his business around for the long haul. Blue Shades is next to El Basha and across from Park Grill & Spirits on Park Ave.
Chang, who came to the city with his family as refugees from Vietnam in 1981, attended South High Community School and was introduced to business at a young age when his parents became franchisees of a national gas station chain on Route 20, which they still own and operate. He grew up in the hospitality industry and worked at various Asian bistros and hibachi restaurants, eventually spending a few years at Wareham’s now-closed Zen Asian Grille. But he always knew a return to Worcester was in his future. Within a few months of sparking the idea with his sister, Chang was receiving waffle recipes from his friend in Hong Kong. Chang tweaked them to his tastes, added some Western touches, and Blue Shades quickly became the new kid on the block. Blue Shades’ dough, made similarly to that of brioche, combines with pearl sugar – a sugar resembling a plain grain of sugar with a bonus of immense flavor – to make the waffles a bit denser than the typical American waffle, and with a sweeter flavor and chewier texture. Of course, these are anything but typical American waffles. Waffles have adorned American breakfast plates since forever – or at least since Thomas Jefferson purchased a French-made waffle iron in the 1790s – and yet it seems we have been eating them incorrectly. Originating in Liège, Belgium, proper waffles, according to Blue Shades, are a street food meant to be eaten with your hands and without a gallon of maple syrup. Try the California waffle … yup, that’s avocado. Introduced to America at the 1964 World’s Fair in New York City by Belgian native Maurice Vermersch, Liège waffles have somehow only recently begun trending. Cooked made-to-order, the Belgian waffles of Blue Shades come with an aroma that lingers in the air, wafting out onto Park Avenue to lure college students, office workers and any other passersby. Waffle lovers who don’t come too late can indulge their inner Belgian by ordering the plain Liège waffle with powdered sugar, or they can take their cravings a bit further and fully explore the menu. 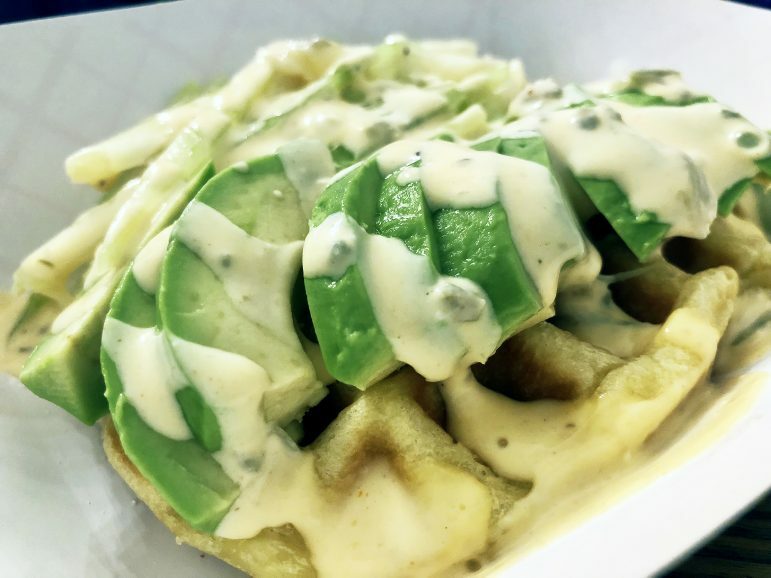 Decadent waffles such as the California, a waffle topped with avocado, cucumber and house-made sauce; and the Firehouse, a waffle topped with jalapenos, banana peppers and spicy mayo, are two of Blue Shades’ signature twists. Not to worry, the Blue Shades menu doesn’t go from zero to 60. 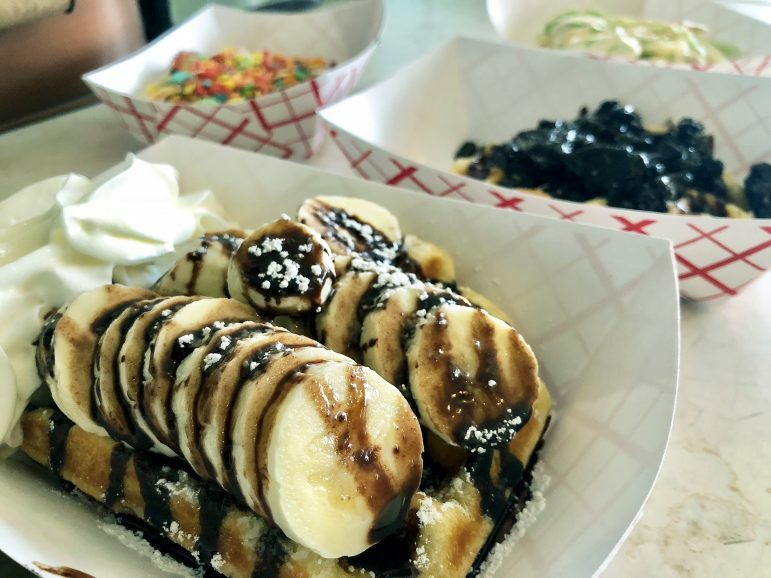 There are levels that can be appreciated by less-adventurous eaters, for instance specialty waffles like the Nutella, S’mores and Fruity Pebbles bacon wrap. While waffles take center stage, they’re hardly the only offering here. Facebook reviewers rave about the eatery’s drink choices, including Velvet Tea, caramel iced coffee, cappuccino and an Earl Gray latte. Its Tom Yum soup, pork buns and DanDan noodles also draw accolades. 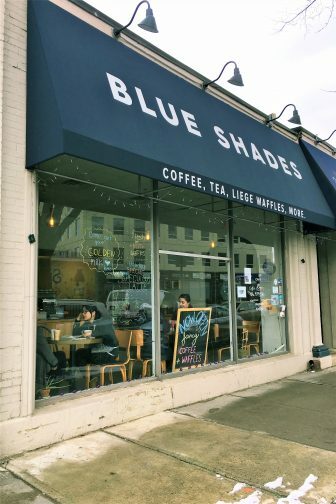 Blue Shades customers can park in the limited spots available at the former C.C. Lowell location. On-street parking is also available. The restaurant is open 7:30 a.m. to 8 p.m., Mondays through Saturdays. With the food scene reaching more corners of the city – and bringing with it even farther-flung corners of the culinary world – Blue Shades has somehow imported a specialty Belgian waffle, via Hong Kong, and made it ours.